Simon Hopkins of Prysmian gives a quick reminder of the range of fire performance characteristics that can be expected from different types of cable. With the current acute focus on the issue of fire in buildings, it’s worth taking a second look at the range of fire performance offered by different types of cable in the market. It’s a hierarchy of performance from basic building wires up to the specialist fire resistant cable used in safety-critical applications. In between there is a range of low fire hazard cables where the definitions can be a bit hazier. At the entry level, all building wires need to perform to basic safety standards – they should not help a fire to spread by having combustible outer sheaths and are considered safe to use in domestic buildings and low-rise commercial applications. As of July 2017 all cable sold in the UK for use in permanent installation in any building must conform to basic fire safety standards. This is part of the Construction Product Regulations and the CE marking scheme that was introduced last year. At the other end of the fire performance hierarchy are fire resistant cables – such as Prysmian’s FP range. These cables are designed for the power and control circuits of safety-critical equipment such as fire alarms, emergency lighting and fire-fighting systems. They need to ensure that circuit integrity is maintained in a fire for long enough to ensure all the occupants of the building have had time to escape. Fire resistant cables are the subject of a number of British Standard tests and specifications – the most important is BS EN 50200 Annexe E, which tests for fire resistance when combined with impact and water spray. In the middle ground, however, are low fire hazard cables and within this group is a range of descriptions used by manufacturers that can cause confusion. Low fire hazard cables are not expected to provide the prolonged circuit integrity expected of fire resistant cables, but they should prevent the spread of flame and they also should not produce black smoke or toxic fumes when they burn. Terms such as “low smoke” “flame retardant” and “low fumes” are used to describe the performance, but care is needed as such terms can be specific to individual manufacturers. These cables are typically used in public buildings where people may not be familiar with the layout of the building or the position of exits. In this situation, smoke and toxic gases are more of a hazard than flame in the early stages of a fire when people are trying to escape. Standard building wires typically use PVC in their manufacture that will give off a black toxic smoke when it burns, dramatically reducing visibility. 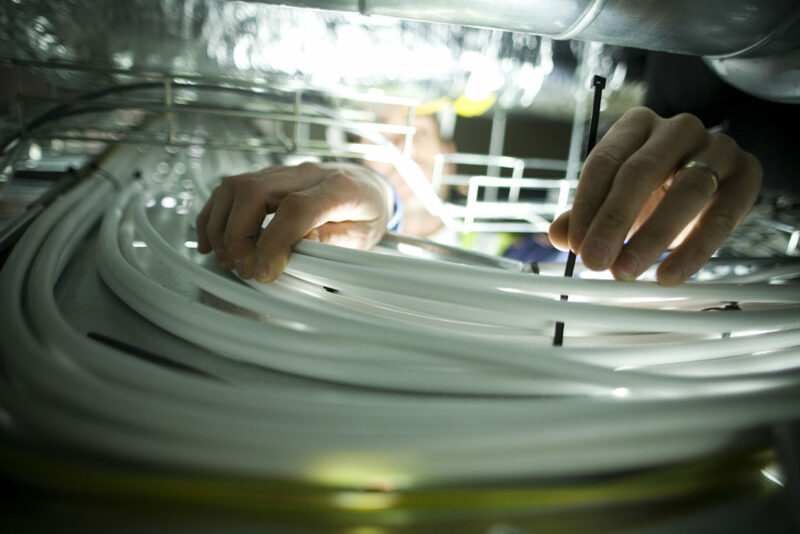 Prysmian has tested cables – some claiming to be “low smoke” – that within three minutes caused light transmittance (and hence visibility) to drop to less than 5% within three minutes. A cable officially described as “Low Smoke” should have been tested in accordance with the standard BS EN 61034-2, demonstrating that very little smoke is given off and that visibility remains good during evacuation. When PVC burns, it also emits acidic, almost invisible hydrogen chloride gas (HCI). This horrible gas typically accounts for over 20% of the emissions produced by burning PVC and, when mixed with water, it turns into equally dangerous Hydrochloric acid. The product test that measures the amount of HCI released is BS EN 50267-2-1. A cable that passes the standard will release emissions which are less than 0.5% HCI when it burns. In Prysmian’s lexicon, we call this zero halogen – and our LSX cable combines zero halogen with a tested low smoke characteristic. LSX also includes an internal layer of aluminium which is a key part of the useful dressability of the cable. It also provides protection from electric shock, should anyone be unwise enough to hammer a nail through into the conductor. This characteristic allows LSX to be used without additional protection in voids such as stud walls and underfloor areas where installing significant surface protection would be a nuisance and additional cost. The information on just what is meant by “fire performance” is all available on manufacturers’ websites, but it does need a bit of a check now and again to make sure you are up to date with the latest performance standards and that you are absolutely sure what “low fire hazard” actually means in relation to the particular cable product your customers need. Pictured top: Prysmian’s LSX cable combines zero halogen with a tested low smoke characteristic.